Fill out the form below to get more information from a Product Specialist. Everything You Need Built into the Core. Our DMS comes out of the box with built-in Fixed Ops and Communication suites so you can avoid duplicate work and wasted time spent jumping between third parties. 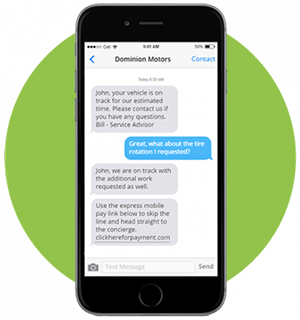 Mobile Pay, text and email status updates, system alerts and electronic Multi-Point Inspections are all built into the core of Dominion VUE -- providing friction-free processes. Your customers will know their exact vehicle status and when it will be finished thanks to Dominion VUE’s automatic text and email alerts. Give your customers the option of Mobile Pay when checking out in the service department. This enables them to skip the cashier line and enjoy a concierge delivery process. 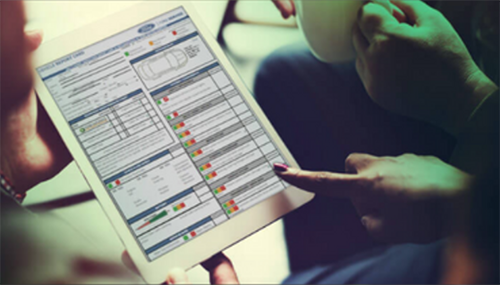 Now your Service Techs can perform inspections right from their iPad Pro or Surface tablets. Set up system generated alerts based on your selected criteria. These alerts will help management stay up to date on order approvals, financing and new appointments. "I have the only true cloud DMS on the market. Dominion listens to me and is a partner I can trust."